The Galápagos Islands are one of the most popular diving and snorkeling sites in the world because of the amazing and diverse wildlife that can be found in the waters off the islands. This includes the giant whale sharks that often feed off the most remote of the Galápagos Islands. There are many different ways that you can view and interact with the marine wildlife found in the Galápagos Islands. For some people, just taking a boat ride around the islands to see the animals is enough. However, for most people who are drawn to the islands, they want to get in the water and interact with this amazing wildlife. The wildlife you will see when snorkeling and diving in the Galápagos Islands are amazing, like this octopus that we saw on our recent trip. In this guide, I am going to outline all of the things you need to know to go on the snorkeling or scuba diving adventure of your life in the Galápagos Islands. I will outline all of the things you need to know before you go to make sure your trip is successful, as well as outline some of the top snorkeling and scuba diving sites in the islands you have to choose from. No matter what your skill level in swimming, snorkeling, or diving, there is something for everyone to enjoy. The purpose of this guide is to give you all of the information that you need to know to make sure you pick the excursions and adventures that match your interests and experience. That way, you will be able to get the most out of this amazing experience! Before you start planning your adventure, it is imperative that you read this section of my guide so that you are fully prepared for your trip. Before you make any travel arrangements or plans to visit the Galápagos Islands to snorkel or scuba dive, it is imperative that you read this section of the guide. You will need to make sure that you are prepared for your trip and that you have the right level of excursions picked to suit your skill level. If you are planning on doing some scuba diving while in the Galápagos Islands, you will also need to make sure you have the proper certifications and insurance. This is essential as dive operators will require the certification and ask for proof of certification. This includes making sure that you have the proper Nitrox certification. In addition to making sure you plan the right excursions for your skill level and interests, it is important that you have the right gear with you when you visit the Galápagos Islands. For instance, many tour companies do rent out wetsuits for snorkeling and diving expeditions, but many do not. For this reason, we strongly recommend bringing all of the gear that you will need on your trip. I outline the main gear you will need below, as well as include a reference to my general Galápagos Islands packing guide for you to review as well. Be sure to read the general packing guide because it also outlines the immunization requirements that are necessary for visiting Ecuador. If you are planning to do some snorkeling in the Galápagos Islands, you will want to make sure you are prepared before you go. Below is a list of some of the gear that I would recommend that you bring to the Galápagos if you are planning on going on some snorkeling excursions. The waters on the surface can range from 67-80 degrees Fahrenheit (or 19 to 26 degrees Celcius), so depending on when you visit, a wetsuit may be necessary if you get uncomfortable in the cold water. It is also important to prepare for being around, on, and in the water much of the time you are in the Galápagos, so make sure you have the right gear to protect your valuables and electronics. If you are planning on going scuba diving in the Galápagos Islands, chances are that you probably have your own gear. If you do, I would highly recommend that you bring it. You will want to make sure you are familiar with and comfortable with the gear you use on the dives in the islands. If you don’t have your own gear, you will want to think about purchasing gear before your trip. Many tour operators will provide gear, but you will want to confirm before you go if you don’t plan on bringing your own. If you do buy gear, I would strongly recommend that you try it out and become comfortable with it before your trip. If you are a beginner and don’t have gear or scuba diving certification, there are places where you can get certification in the Galápagos Islands. If you don’t take care of these certifications before you go, I would strongly recommend making these arrangements well in advance of your trip. Because most of the dive sites in the Galápagos Islands involve strong currents and surge, I also strongly recommend that you purchase the proper dive insurance before you go on your trip. The dives in the Galápagos are not the easiest dives and you will be glad you have it if you end up needing it. Emergency medical evacuation and the use of a hyperbaric chamber can run into the tens of thousands of dollars. Snorkelers enjoying the wildlife on an excursion in the Galápagos Islands. The Galápagos Islands are one of the premier locations in the world to go snorkeling. However, depending on what you would like to see, how you are visiting the Galápagos, and how proficient you are at snorkeling, some locations will be better suited for you than others. There is an abundance of wildlife around the islands, so make sure you prioritize which wildlife you really want to see the most before you start making your travel plans. A marine iguana swims to shore after feeding on algae that grow on submerged rocks offshore. If you are planning on going on a LiveBoard tour, in which you live on a boat and cruise about the islands, you will be able to reach the more remote locations in the Galápagos. This will allow you to visit some of the sites on my list that you aren’t able to visit when you take a land-based tour. However, just because you book a land-based tour, that doesn’t mean your options are limited to less amazing snorkeling sites. There are plenty of snorkeling sites on this list that are accessible via land-based tours. 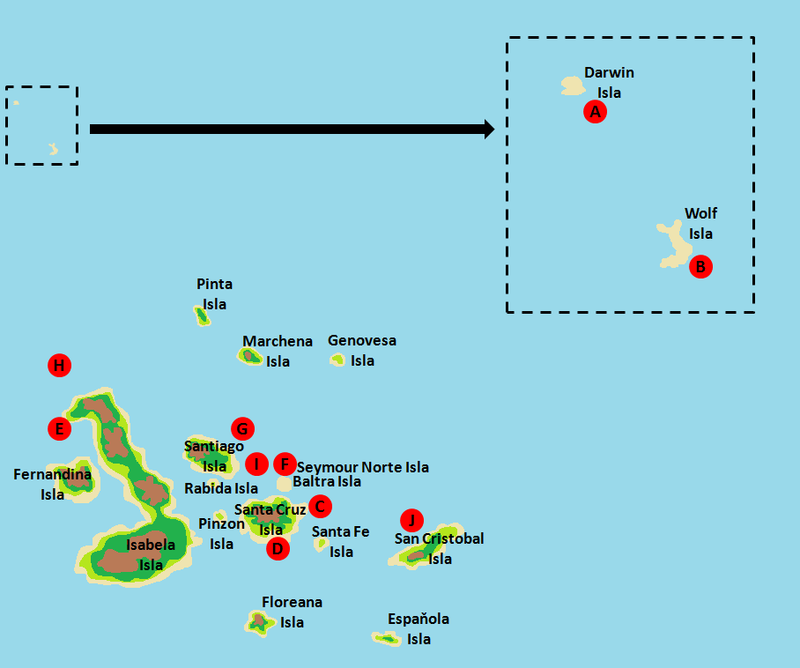 Map of the top snorkeling sites in the Galápagos Islands. A green sea turtle surfaces for air during one of our snorkeling adventures. Located off the island of Isabela, the Los Tuneles snorkeling spot is a great place for beginners to start their snorkeling adventures. With its crystal clear and calm pools, it is an ideal place for wildlife viewing. The strange lave rock formations offer some unique places to explore and it is common to see Galápagos Penguins, Green Sea Turtles, Blue-footed Boobies, Rays, White-tipped reef sharks, Galápagos Sea Lions, and a variety of tropical fish. The Los Tuneles snorkeling spot is only accessible via a land tour, which can be purchased in Puerto Villamil on Isabela Island. If you would like to book a snorkeling tour at Los Tuneles, make sure you book well in advance as this is an extremely popular tour. With a reputation as one of the best snorkeling spots in the Galápagos Islands, the Devil’s Crown location off of Floreana Island is an amazing snorkeling spot. Although the currents in this submerged volcano can be challenging for beginners, the coral reef in the center of the sunken volcano is home to an abundance of amazing wildlife. It is not uncommon to see large Manta Rays, Green Sea Turtles, and White-tipped reef sharks, and Galápagos Sea Lions in this spot. This spot can only be accessed via Galápagos Islands cruises as all land tours focus on the primary islands in the Galápagos (Santa Cruz, Isabela, and San Cristobal). Not all cruises stop at Devil’s Crown, so if you are interested in visiting this spot, make sure you check the itineraries of cruises before you book. Snorkeling at Kicker Rock is a difficult tour to find, but if you can find an opening on a tour I would strongly recommend it because it is an absolutely amazing place to go snorkeling or diving. The natural channel that the rocks form is home to a stunning variety of wildlife that includes Eagle Rays, Green Sea Turtles, White-tipped reef sharks, and Galápagos Sea Lions. If you are really lucky, you might even spot Galápagos sharks, Hammerhead sharks, or dolphins at the rocks. This site is accessible via land tour or cruise, but many tours will only stop to admire the rocks instead of actually offering snorkeling at the rocks. So if you are interested in booking a snorkeling tour at Kicker Rock, make sure you read the itinerary very closely. I also touch on this location in the scuba diving section of this guide as Kicker Rock is an amazing place to scuba dive as well. Because it is accessible by either a cruise or a land-based trip, Bartolome is a popular stop for a lot of tours in the Galápagos Islands. It is situated off of Santiago Island, which is only accessible with a naturalist cruise, but Bartolome is located just off Santiago and offers some really exceptional snorkeling conditions as well. In fact, it is one of the best places in the Galápagos Islands to see Galápagos Penguins. You also have a great chance of seeing plenty of tropical fish, White-tip reef sharks, the occasional octopus, and Galápagos sea lions off the jagged coastline of Bartolome. Best of all, because the waters are usually very calm, it is another great place for beginners to get their feet wet. Tintoreras is one of the most popular snorkeling spots in the Galápagos Islands because you have a chance of seeing a large amount of the wildlife that lives in the Galápagos in this one spot. For this reason, Tintoreras has been given the nickname of the “mini Galápagos”. With Galápagos Penguins, Galápagos Sea lions, Marine iguanas, Green sea turtles, White-tipped reef sharks, and Blue-footed boobies all frequently this location, it is a hot spot for marine wildlife viewing. It is another location that has generally calm waters that are good for beginners. Best of all, it can be accessed both by land trip or cruise, so it is very accessible. In addition to the stunning vistas you can see from the shores off the Punta Espinosa snorkeling site, there is an abundance of amazing wildlife to see in the waters. Widely considered one of the best snorkeling sites for seeing a diverse array of wildlife, snorkelers have the opportunity to spot Galápagos Sea lions, Marine iguanas, Sea turtles, and Galápagos Penguins among other wildlife while snorkeling. For those who are lucky, you might even spot an orca or a whale. Blue and Humpback whales are known to visit the Galápagos Islands between June and December each year. If you are serious about doing some snorkeling while in the Galápagos, this site should be near the top of your list. Located off of Isabela Island, the Tagus Cove snorkeling site is widely considered one of the best places to get in the water with the Galápagos Penguins. The smallest of the world’s penguins, it is also the only penguin that is found North of the equator. Although they aren’t the fastest creatures on land, they are like missiles flying thru the water when they swim. In addition to being able to swim with these amazing animals, the Tagus Cove snorkeling site is also known to have many Green Sea turtles, Marine iguanas, Flightless cormorant, Seahorses, Port Jackson shark, Rockfish in the area, which makes it a popular spot for snorkelers. Named after Prince Phillip, who was the husband of Queen Elizabeth II, the Prince Phillip Steps snorkeling sites is one of the more remote snorkeling sites I cover. Located off the coast of Genovesa Island, this snorkeling site is less accessible than some of the other sites on my list. Because of its location, you will only be able to access this site as part of a Galápagos cruise. However, it is located in some of the prime areas for seeing some of the most unique marine wildlife in the Galápagos. Snorkelers have a chance to swim with Manta rays, hammerhead sharks, tropical fish, angelfish, parrotfish, hogfish, unicornfish, surgeonfish, butterflyfish. For this reason, it has become a popular spot for people on extended Galápagos cruises. Pinnacle Rock, which is a large, spired rock formation that juts from the ocean near Bartolome, is home to one of the Galápagos Island’s most unique and beautiful snorkeling sites. At the whitish-pink sand beach just to the East of the Pinnacle Rock, green sea turtles lay their eggs and can often be seen swimming around the rock. In addition, the snorkeling site is home to an abundance of white-tipped reef sharks and Galápagos penguins, who can be observed doing their aquatic acrobatics in search of fish to eat. Pinnacle Rock is also a favorite resting place for Galápagos sea lions, who can often be found in the waters and sleeping on the rocks around the pinnacle. Named for the sea lions that inhabit the shores, the Isla Lobos is widely considered the best place in the Galápagos Islands to swim with Galápagos sea lions. A protected cove on the Western side of the island is the perfect place for these friendly creatures to seek refuge from the sea and relax so they can be found in this location in abundance. The calm waters, clear visibility, and sandy sea floor make this a perfect place for snorkeling. The main attraction at this site is to swim with the baby sea lions, who are always playful and inquisitive. In addition to the sea lions, snorkelers can also get a glimpse of Blue-footed boobies and Galápagos Brown pelicans, who are often seen fishing off the shores. The Galápagos Islands are known for large schools of hammerhead sharks, which can be incredible to see when scuba diving. Scuba diving in the Galápagos Islands is one of this world’s ultimate adventures. Divers flock from around the world to the Galápagos to see the large schools of hammerhead sharks and the graceful and giant whale sharks that congregate around the islands. Before you book your scuba diving adventures, I would suggest you review my list of the top diving sites to understand what unique qualities each site offers. That way you can make sure you pick a tour that allows you to see and experience everything that you want to see when you visit. You don’t absolutely have to take a LiveBoard cruise in the Galápagos in order to do some scuba diving in the islands, but in order to access a majority of the sites on my list, booking a LiveBoard cruise will be essential. Therefore, if you are really serious about doing some scuba diving when you visit, then a LiveBoard tour is definitely the way to go. Map of the top scuba diving sites in the Galápagos Islands. A Galápagos shark is a common site when scuba diving off the Galápagos Islands. Located in the far reaches of the Galápagos Islands, Darwin’s Arch is the most remote of the dive sites I am covering in this guide. However, even though it is remote, it is arguably one of the most famous dive sites in the Galápagos. This amazing site affords divers the opportunity to see manta rays, green sea turtles, dolphins, and even the elusive whale shark. However, the biggest draw for this dive site is the massive number of sharks that are attracted to the strong currents. This includes large schools of hammerheads, silky sharks, blacktip sharks, and Galápagos sharks. Because of the strong currents, you should have ample diving experience before attempting to dive at this site, which is why the site is listed as an intermediate to advanced dive. 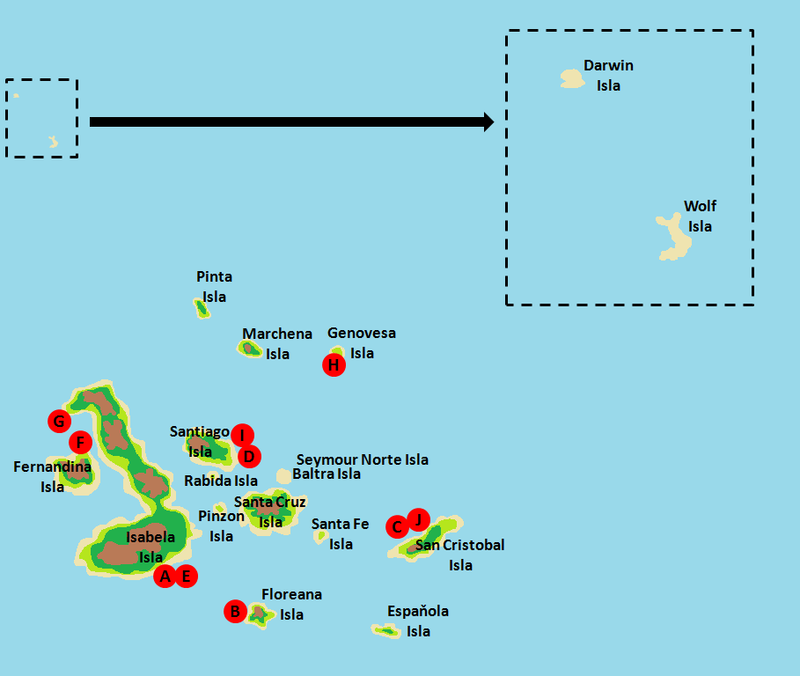 Located off of Wolf Island, which is the sister island to Darwin Island in the far reaches of the Galápagos Islands, Shark Point is another of the famous Galápagos dive sites. If you want to dive with whale sharks, this is the spot that will give you the best chance to do that by far. These elusive sharks gather near the islands between May and November, which attracts large numbers of divers looking to fulfill their dream of swimming with these gentle giants. In addition to the whale sharks, it is also possible to see large schools of hammerhead sharks and the Galápagos shark at this dive site. However, because of the limited visibility and very strong currents, this dive site is restricted to just experienced divers only. Considered by many to be one of the best dive sites in the central islands, Gordon Rocks is located in the submerged cone of a volcano on the Northeast side of Santa Cruz Island. This dive site has become famous for the large schools of hammerhead sharks that are drawn in by the strong currents in the area, making it the prime location to get views of these magnificent creatures. Because of the large numbers of sharks in such a small and confined location, it is possible to get closer to the sharks than anywhere else in the Galápagos. However, because there are such strong currents and it is such a confined dive site, you should have ample diving experience before attempting this dive. If you are a beginning diver that wants to experience the underwater wonders of the Galápagos Islands, then the Camaño Islet is a great option for you. Located off the coast of Santa Cruz Island, this dive site attracts schools of grouper, batfish, and other tropical fish. Divers also have the possibility of seeing Galápagos sea lions playing and even marine iguanas feeding on algae that grow on the submerged rocks off the coast. Because this site isn’t that deep, with waters that max out at between 30-50 feet (10-15 meters), and the visibility is typically good, it is a great dive to get your feet wet. Located off the coast of Isabela Island, the Punta Vicente Roca dive site is a sloped dive wall that has several small caves along it. With a depth between 40 to 80 feet (or 12-27 meters), this dive site is an excellent place to see Galápagos penguins and Galápagos sea lions hunting fish. However, the real draw is all of the amazing fish that congregate in the area. Divers are typically treated to seeing the beautiful sunfish, as well as the huge Mola Mola that are typically spotted on the outside of the seawall. This isn’t an overly difficult dive site, but because of the depths, it is recommended that you be of at least an intermediate level before attempting this dive. There is no shortage of things to see when diving at North Seymour so you might want to extend your time at the dive site beyond just one dive. This dive site, which involves a gradual slope on the Northeastern shore of North Seymour Island, is a great place to spot yellowtail grunts, blue-striped snappers, and other tropical fish. However, the biggest draw at North Seymour is arguably the large numbers of rays that can be found here. Large groups of eagle rays, marble rays, manta rays, and stingrays congregate in the area. Divers also have an opportunity to see hammerhead sharks, and on occasion, even marlins. Because of the shallow depths, clear waters, and lack of really strong currents, this dive site is perfect for beginning divers who want to encounter a lot of wildlife in the Galápagos Islands. Considered by many to be the most consistent dive in the Galápagos Islands, the Cousins Rock dive site might be the best dive site for intermediate divers. Located off the Northeast coast of Santiago Island, this site is comprised of steps that descend over 130 feet (or 40 meters) into the depths. These steps are covered with black corals, and it is in these corals that you will typically find many Pacific seahorses. Under the ridges of the steps, you can typically spot white-tipped reef sharks, moray eels, and even green sea turtles. If you are lucky, you might even spot a school of barracuda or hammerhead sharks swimming thru. If you are interested in getting up-close-and-personal with the volcanic activity that shaped the Galápagos Islands, then the Roca Redonda dive site is right up your alley. Famous for the streams of gas that bubble up from the floor of the site, the Roca Redonda dive site allows divers to get a view into the heart of the Galápagos Islands. However, be aware that this dive site is extremely challenging because of the heavy currents and the fact that divers will need to be able to pull themselves along the rocky ocean floor in order to be able to view the gas streams, known as fumaroles. If you are lucky, you might even catch a glimpse of some Galápagos sharks that are known to frequent the area. Considered by many to be one of the best dive sites in the Galápagos Islands, the Bartholomew Point dive site combines fascinating rock formations with an abundance of marine wildlife to form a spectacular dive environment. This dive site is known for the abundance of bait balls, which are tightly packed schools of small fish, that form in the area. These bait balls draw in a plethora of marine predators, such as Galápagos sea lions, pelicans, white-tipped reef sharks, and a variety of different rays. Divers also have the possibility of seeing green sea turtles, and if they are lucky, even hammerhead sharks. This dive site should be on the list of any experienced diver who is visiting the Galápagos islands to dive, especially for the first time. I already discussed how great of a site Kicker Rock is for snorkeling in the snorkeling section of this guide, but the site is a great place to go diving as well. Located off the coast of San Cristobal Island, Kicker Rock was named for its resemblance to a shoe. In between the rocks that form the Kicker Rock dive site, you have a great chance to swim with Galápagos sea lions and see marine iguanas feeding off the algae that grow on the underwater rocks. Kicker Rock is also home to an abundance of green sea turtles, a variety of rays, surgeonfish, and angelfish. If you navigate into the deeper waters, there is a good chance you will spot Galápagos sharks and hammerheads. If you want to book a dive at Kicker Rock, make sure the tour you book includes it. There are a lot of tours that visit Kicker Rock but do not offer scuba diving or snorkeling as part of the tour. Thanks for the really detailed and wonderful guide. Thank you so much for the kind words! Glad you enjoyed it!